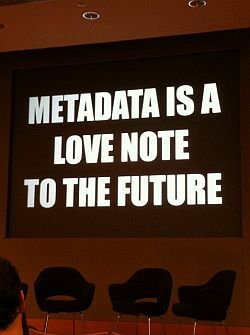 All people dealing with research data management quickly learn that good metadata is key for research data access and re-use. Now Elizabeth Bedford from DCC, the Digital Curation Centre in UK, collected a lot of information about disciplinary metadata standards, including profiles, tools to implement the standards and use cases of data repositories currently implementing them. The ressource can be searches by discipline (biology, earth science, physical science, social sciences and humanities and general research data) or by resource type (metadata standards, profiles and extensions, use cases, tools). Everyone dealing with RDM should have a look at that page – I think it is a very good ressource and provides a valueable overview of disciplinary metadata standards.